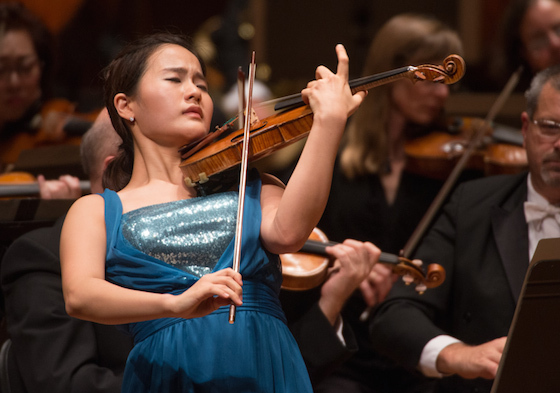 The last Finals in the International Violin Competition of Indianapolis on Saturday featured three of the most beloved violin concertos in the repertoire: the Brahms, Tchaikovsky and Sibelius Violin Concertos. Finalists Ji Young Lim, Yoo Jin Jang and Dami Kim performed with the Indianapolis Symphony Orchestra at Hilbert Circle Theater, with Joel Smirnoff conducting. For this round, each was required to play a full Romantic or Modern concerto with orchestra. First was the Brahms Violin Concerto, which was strong without being rough, and full of well-crafted melody in the hands of Ji Young Lim, 19. Her violin fell out of tune just a touch for the cadenza; she tuned it up before continuing on to the second movement. Kudos, by the way, to Indianapolis Symphony oboist Jennifer Christen for her solid solos during the evening, particularly in this Brahms second movement. Ji Young spun beautiful melodies with the 1794 Guiseppe Guadagnini that she plays, and with just the right amount of vibrato. Again, I noticed that Ji Young really knows her bow planes, the very specific angles in which the bow needs to travel its full length to nail a note on each string or combination of strings. It's a way of defying gravity, not allowing it to mess with your bow travel at any point. All this is a complicated way of saying she has an awesome bow arm! Yoo Jin Jang, 23, has such fast fingers, it made for exhilarating passagework on one hand; on the other hand, occasionally things like grace notes were inaudible for their speed, and the solo part had a tendency to move ahead of the orchestra. But what technique! I particularly enjoyed the part (after the second orchestral tutti and before the cadenza) where the theme is outlined in bouncy double-stops -- just so clean, precise and exciting. 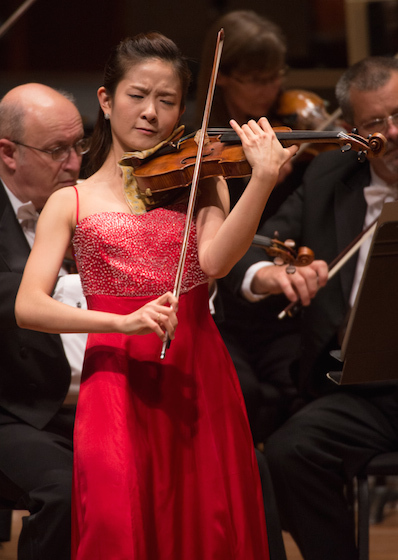 During the second movement, Yoo Jin projected the "Canzonetta" melody with an intensely rich and beautiful sound, particularly on the D-string. Impressive and satisfying though it was to hear, I can see how judges might not see it as being in the spirit of this well-known work (thought it's highly possible it didn't matter to them in the least!). Tchaikovsky marked the entire movement "con sordino," which means that Tchaikovsky intended it to be played with a mute dampening the sound of the violin. To be sure, many people do skip this request by the composer, as it's difficult to project the sound of a solo violin over an orchestra when it's dampened with a mute. Nonetheless, Tchaikovsky's marking implies a certain slackening of intensity that wasn't really reflected in Yoo Jin's richer-sounding approach. Yoo Jin really owned the third movement, during which she used Tchaikovsky's original repeat scheme and not the Auer edits. It was spirited and enjoyable, and every one of those kabillion (I counted them) notes was sparkling (like her dress!). During the last orchestral tutti, conductor Joel Smirnoff set up a juicy orchestral accelerando, and Yoo Jin caught that wave and rode it out to a very exciting ending. The audience went wild and gave an immediate standing ovation. 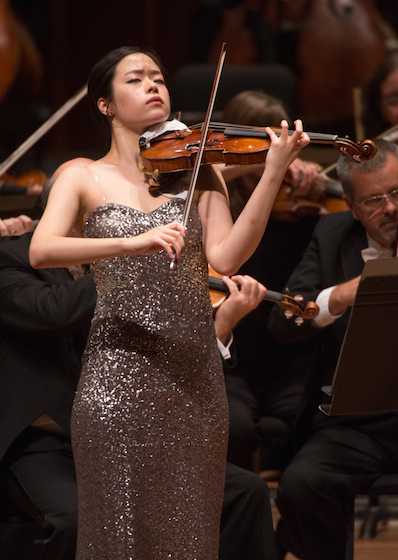 What better for the Nordic cold of the Sibelius concerto, than the shimmering silver dress that Dami Kim, 25, chose? (And before you get on me for talking about women's dresses, they are an undeniable part of a public performance, and a good choice is important.) She really drew the maximum from her violin and for the cadenza the notes seemed to just spill effortlessly. She held the tension well in the second movement, climbing powerfully when needed, and backing off when needed. She showed beautiful control in the harmonic that ended the second movement. The opening of the third movement wobbled ever so slightly. Certainly this movement demands high technique, and she has it: octaves, crystal-clear harmonics and much more. She showed good awareness of the orchestra, as well. After Dami came a period of time during which the jury delivered their scoring and a computer tallied it. During this time, violin researcher Claudia Fritz and violin maker Joseph Curtin conducted an experiment, asking the audience to fill out a paper rating their opinion of about a dozen violins. They were rated two at a time; pick your favorite of two. Violinist Giora Schmitt played the opening of the Tchaikovsky concerto over and over. Having done a listening test like this a few days before, I did not participate (actively) in this one. But I'll say that it was very hard to discern any difference at all in any of the fiddles. One audience member came up to me and said, "It's like comparing oranges to oranges to oranges!" Still, I applaud the violin makers' efforts to find, in the most objective way possible, what pleases players and audience members most in a violin. Laureates were announced at the end of the evening: 1st Jinjoo Cho; 2nd Tessa Lark; 3rd Ji Young Lim; 4th Dami Kim; 5th Yoo Jin Jang and 6th Ji Yoon Lee. Here is our story that describes the prizes and placements.